An established name in the indie scene, Vlambeer are best known for their awesome twitch-arcade game Super Crate Box (which is still awaiting a retrospective review here at RGCD), as well as the infamously app-store cloned Radical/Ridiculous Fishing, flash-based Luftrauser and Serious Sam tribute The Random Encounter. 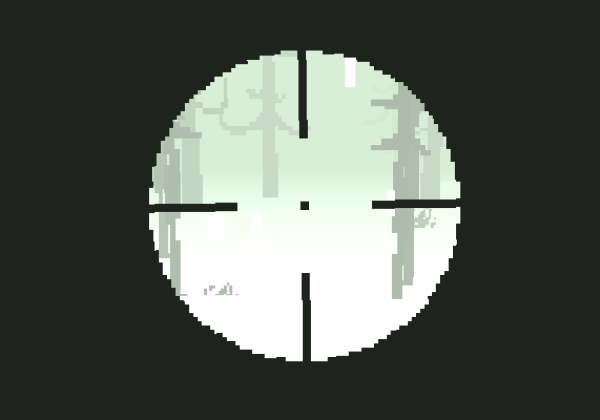 Last September, at Fantastic Arcade they showcased a new first-person shooter with a minimalist attitude - and now it's finally available to the rest of the world, free of charge. 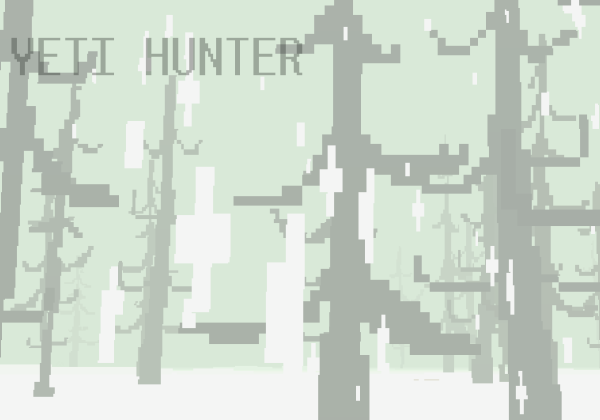 Yeti Hunter has a bit of what I expect from Vlambeer: a tasty lo-fi dressing over simple satisfying gameplay. 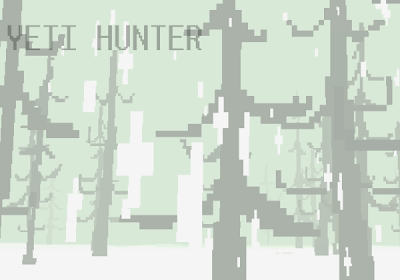 Dispensing with their usual light-hearted attitude, Yeti Hunter is a tense outing that builds suspense fast. The game mercilessly drops you into a confusing context; it quickly becomes clear the crazy task that lies ahead of you. Davy Crockett can grin down a "barr", but even he'd be lost looking for a yeti in a snowstorm. 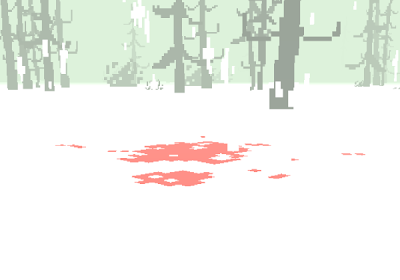 It's one hell of a hunt: a snowy grave with pixels bigger than Ken's Labyrinth and more fog than Silent Hill. The whole enterprise of hunting seems unfeasible on the face of it. Yet the deft craftsmanship of Vlambeer shines through and it proves to be a fun time. I'll outline my personal experience to explain why. My footsteps crunch in the snow as I quickly survey the area. The snow is white, the fog is white, and so every blank pixel must be scrutinized. I have failed at every turn to find my prey, yet always a clue points me forward. Is that a footprint barely etched into the fresh powder? Or is it a flat rock? A mighty growl in the distance? Or is it simply the wind? A shadow of the beast moves... Or is it just snow blowing across a snowbank? Finally, I see an outline. I'm sure of it. I take my shot through the scope and let loose the drums of war. The rhythmic beats punctuate my sprint across the drift as I give chase into that pale green wintry fog. I find nothing. Nothing and the sky dims over me, the night seeps in and I have failed. What little I saw before now hides safe from me in the darkness. I climb a tree, sit, and wait for another chance to kill in the freezing cold. It can get to you. The depth of sound, more than anything, draws you in. (I'm also sucker for 80s sci-fi synth and the music here matches the visuals perfectly.) I know it sounds silly to be so immersed in a flat 3D environment like this. For me, the simplicity reinforces the uneasy nausea of snow blindness. 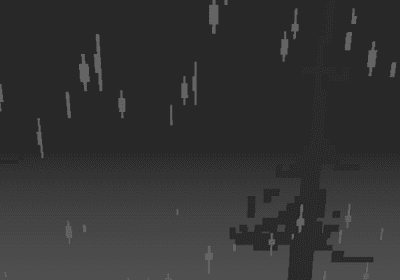 Even now, I'm staring at the innocent white pixels in notepad, wary of the dust on my monitor. It's a mood that's tough to shake. I never did catch that damn yeti. (Thanks to Terry Cavanagh's brilliant news site www.freeindiegam.es for the recommendation). Download the game here (from the game's website). RGCD Online Shop Relaunched & Restocked! C64 16KB Cartridge Game Development Competition!